I’ve debated reading this book so many times over the years, and for some reason I just haven’t committed to it until now. Many of the reviews I’ve read and heard have been mixed, and I guess I was afraid that I would fall under the category of not liking it so much. Fortunately, I ended up really enjoying this book, although I do have a few pieces of criticism to point out. Let’s start with the many things I did like about this novel. First, I love how it all took place in less than twenty-four hours. It takes a lot of detailed, carefully planned writing to pull off a story like this and prevent it from moving too slowly, and these two authors managed to pull it off really effectively. Also, I thought that the alternating chapters of Nick and Norah’s different perspectives worked very well with the story. Sometimes in books it feels like dual perspectives are unnecessary or irrelevant, but in this case it had purpose and benefited the story. It was especially effective in the audiobook I listened to because there were two different narrators- one for Nick and one for Norah. It actually felt like there were two teenagers telling me the story of this one crazy night, and it helped me to become more invested in what was happening. Although the plot kept my attention and the story itself was very entertaining, I couldn’t help but feel as though it was all really corny and overly dramatic. I kept wanting to scream: YOU JUST MET EACH OTHER. LIKE, TWO HOURS AGO. I THINK YOU CAN CALM DOWN A LITTLE. Perhaps it’s just me being cynical, but their tendency to exaggerate and overreact became quite bothersome after a while. Yet despite my initial negative reaction to the cheesy, dramatic personalities of Nick and Norah, I can’t help but think that maybe it is actually more realistic than it first appears to be. I don’t think the plot is very realistic, but the feelings and emotions of the characters definitely have some truth behind them. Teenagers tend to be crazy and rush things and blow things out of proportion (I’m definitely guilty of this myself) and Cohn and Levithan were absolutely successful in communicating those wild, confusing feelings to the reader through Nick and Norah. Viewing this story from that particular angle helps me to appreciate it a lot more than if I were to simply judge it from a surface level. 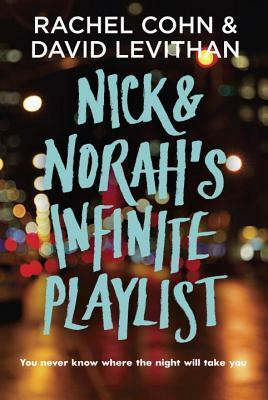 Overall, Nick & Norah’s Infinite Playlist was an entertaining, rollercoaster ride of a read. It wasn’t perfect, but I think it’s definitely worth giving it a chance and I’m happy I finally decided to read it. Once again, David Levithan has not let me down! Would I recommend it to a friend? : Yes, but probably only if they were a fan of contemporary YA romance novels. Otherwise, they most likely would not enjoy it very much. Although I haven’t read the book I am pulled in by the cover (oh how shallow I am!) but it seems like a great read for teens – especially in conveying that yes, kids do tend to feel harder and more intensely. Wow, it took place over less than a day? That’s…whoosh. Great review! I haven’t read this book or seen the movie, but I just read Dash and Lily’s Book of Dares which is written by the same authors. I felt the same way about it being super corny and cheesy, but it was entertaining nonetheless.